The Nintendo Switch was released on 3rd March 2017 and UK stock has been in short supply ever since. We've set up this automatic stock tracker and alert system so that you can be easily and quickly notified of online Switch stock as soon as it appears. This Nintendo Switch stock checker is a great way to get your hands on one of the most sought after products. 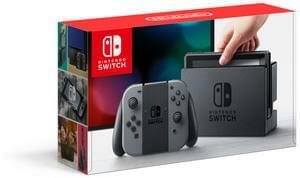 Instant email alerts when the Nintendo Switch comes into stock at any one of the retailers. It's also a great way to compare prices. It seems the grey Nintendo Switch is a lot more difficult to come by than the Neon at the moment! Kelsey Beats me why. Maybe it looks more traditional but it's ultimately the same thing, the gaming system in itself is black regardless. I would have gone with the coloured Joy-Cons if I could. The Neon is available on Base for its RRP. Kelsey Argos is one to add to the Stockchecker I think! I think the Zavvi price may be wrong!